Fashion month is wrapping up today in Paris and I still haven't reviewed Milan! 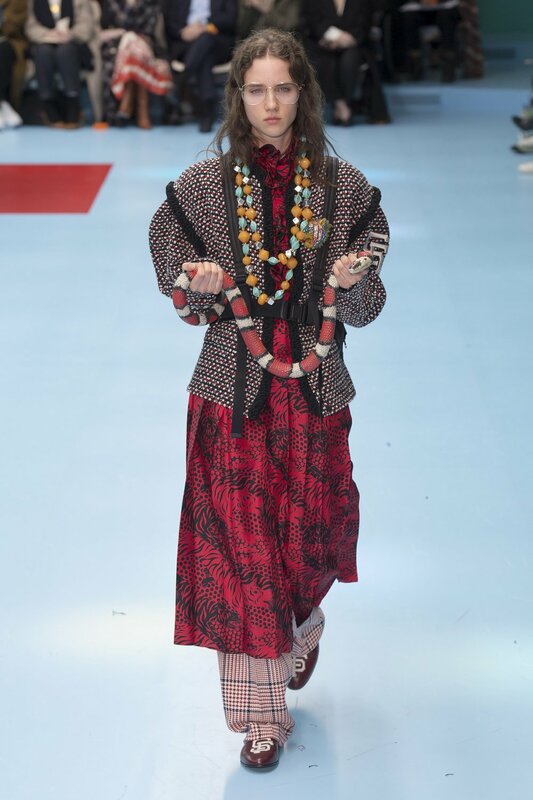 I offer my apologies and also ask that you bear with me as we take an unconventional but hopefully rewarding deep-dive into the most important fashion that came out of Milan. At a high level, the clothes in Milan didn't scintillate. At least for me. 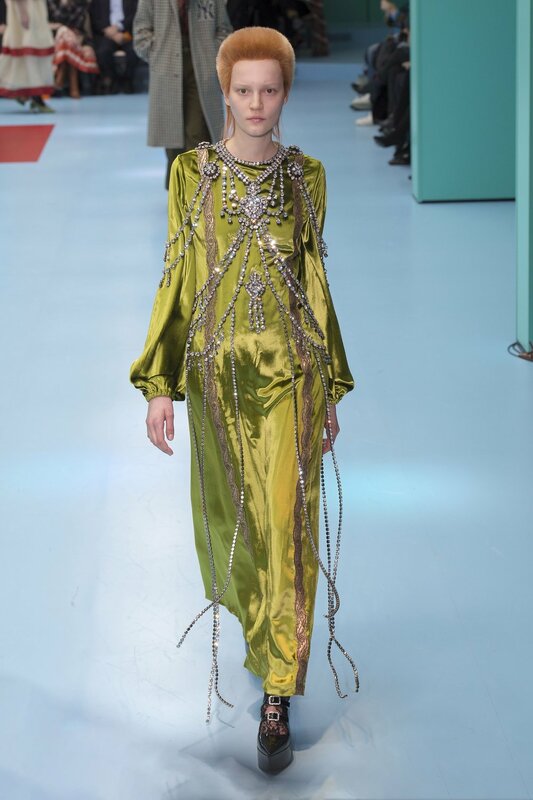 I found a few of the collections enjoyable (Erika Cavallini, For Restless Sleepers, Attico, Philosophy di Lorenzo Serafini) but I didn't fall in love with the clothing. I didn't yearn for it to be hanging in my closet. I didn't dream of wearing it to drink a caffè in an Italian piazza. I could imagine a world without most of it, frankly. I don't mean to say any of this to sound harsh or critical or dismissive of the immeasurable human effort it takes to pull a fashion collection off. I am none of those things, and if anything, I consistently err on the side of awed by the depth of talent one must possess to breathe life into a piece of fabric. I say this because the tepidity of the Milan collections represented to me the manifestation of a bigger and more pervasive issue. The fashion system in which designers are operating—the fashion system in which we participate when we buy clothes—isn't supporting the creation of extraordinary clothes. That takes time and space, it takes designers having creative latitude, and then it takes knowing that the result of that creative latitude won't be subjected to a set of relentless, even unrealistic, commercial expectations. Without extraordinary clothes being made, the system we've set up is curtailing fashion rather than promoting it. 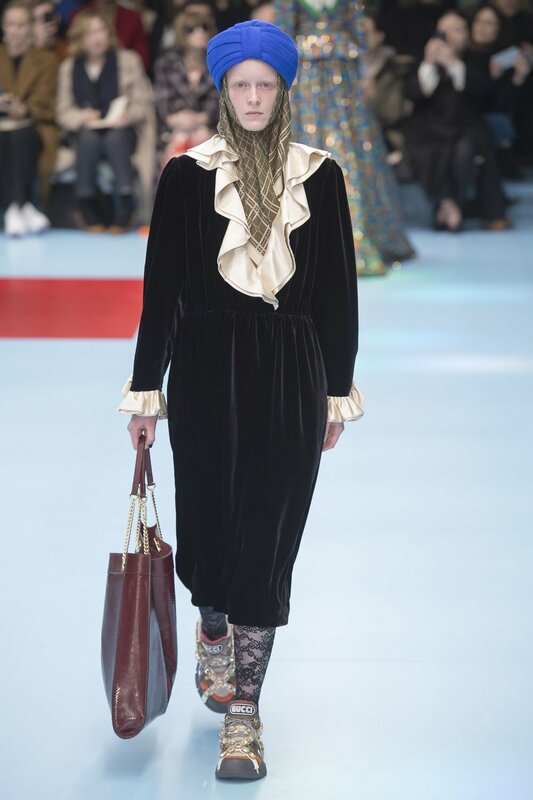 To articulate my point, I've opted to forgo the customary recap and instead look closely at two of the collections from Milan: Gucci by Alessandro Michele and Prada by Miuccia Prada. 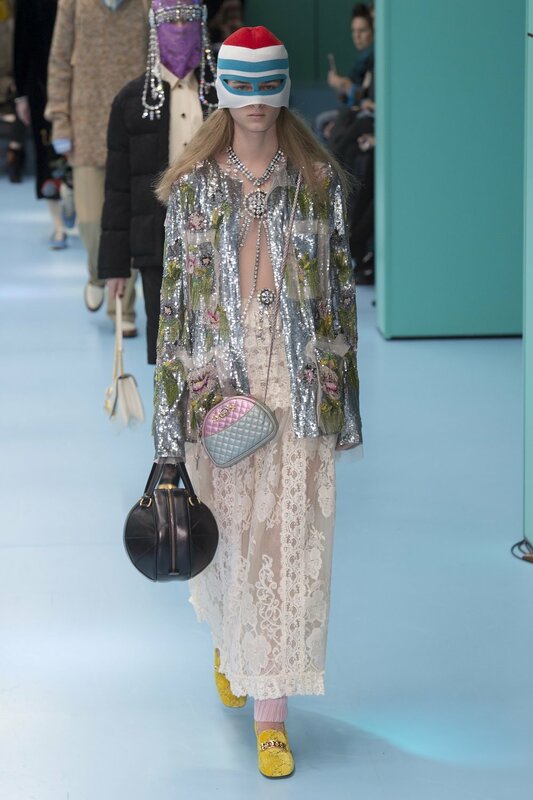 Let's start with the collection from Gucci, which prompted in me something of an existential fashion mini-crisis that I haven't been able to shake off. 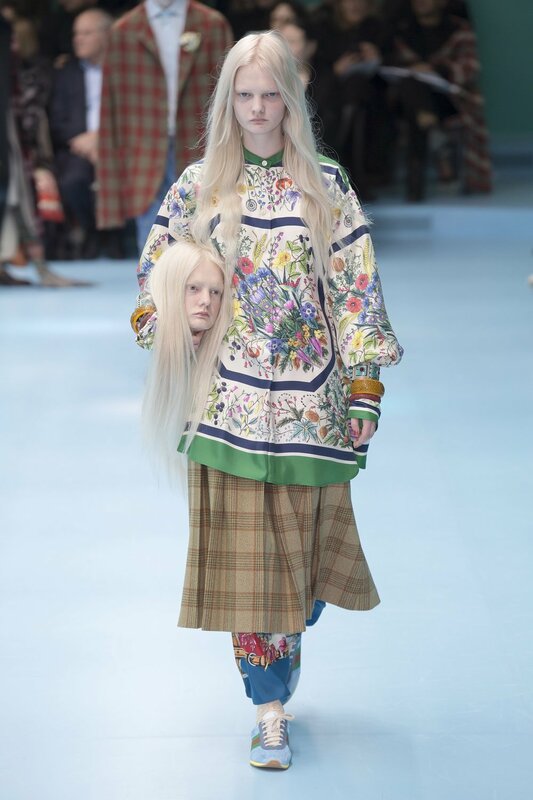 This dystopian scene, model Unia Pakhomova carrying a bust of her own head, screams the question: is this even about clothes anymore? Who cares what she's wearing?! She's carrying her head! Once I got beyond the duplicate unattached head and looked at the clothes, I did some more head scratching (my own, attached), I'll be honest, at their unremarkableness. Michele is smart; what is he saying here about fashion? About the world we're living in? If some of the clothes improved as the show unfolded, the theme continued: in-your-face symbolism screaming much louder than the clothes. There was a mini dragon, another head, a lime-green reptile, and a snake. Beyond the symbolism, there were the symbols. The New York Yankees, and Paramount Pictures, the San Francisco Giants and the Los Angeles Dodgers—powerful, universal cultural symbols, corporate symbols, folded into the styling mix at a high fashion show. And then there were the more problematic symbols, namely, Sikh turbans (worn by predominantly white models). Coming from Michele, someone with such a keen awareness of the zeitgeist, someone who only a few months ago banned fur (for not being 'modern') it's another curious choice. From symbols to symbolism, from cultural criticism to cultural insensitivity, Michele made a lot of statements in this show that didn't involve clothes. I am challenged to make sense of this. Because at its essence, fashion is never about just the clothes, is it? Fashion always represents larger, more intricate notions about how the world works. A piece of clothing represents political systems and economic ones, it represents gender norms and standards and social values and so much more. At the same time, fashion is about the clothes. The clothes are why we're here when all is said and done. 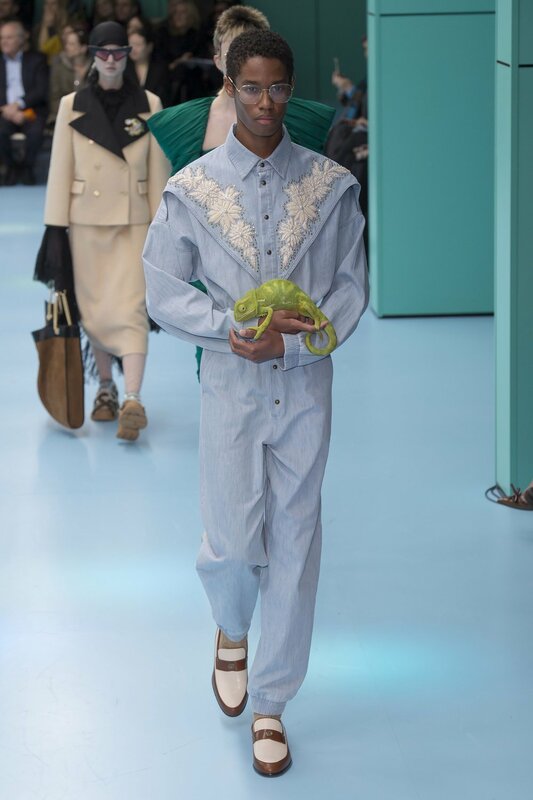 Which is why Gucci perplexed me, and left me questioning deeply: does the fashion industry of today eschew remarkable clothes in the interest of remarkable growth? Are these clothes that Michele is selling or ideas? Or more precisely, are these identities? Next up, Prada. I'll preface by saying that I regard Miuccia Prada (heir to the House of Prada, keen businesswomen, one-time member of the Italian communist party, holder of a PhD in Political Science, an so on) as one of the most intelligent and intriguing women in fashion. Like Michele, she possesses an intuitive understanding of the power of clothes. She knows that clothes say something, maybe everything, about the time in which we live. 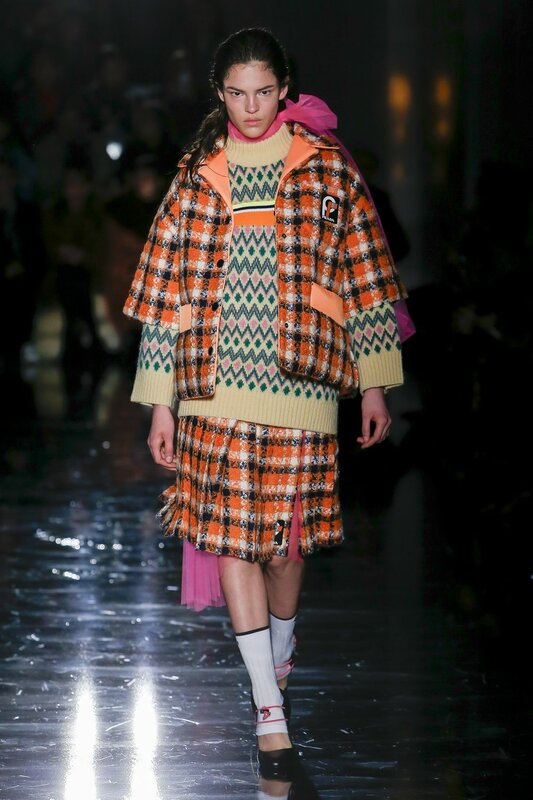 Which is why I was perplexed at the collection of clothes Prada presented in Milan. 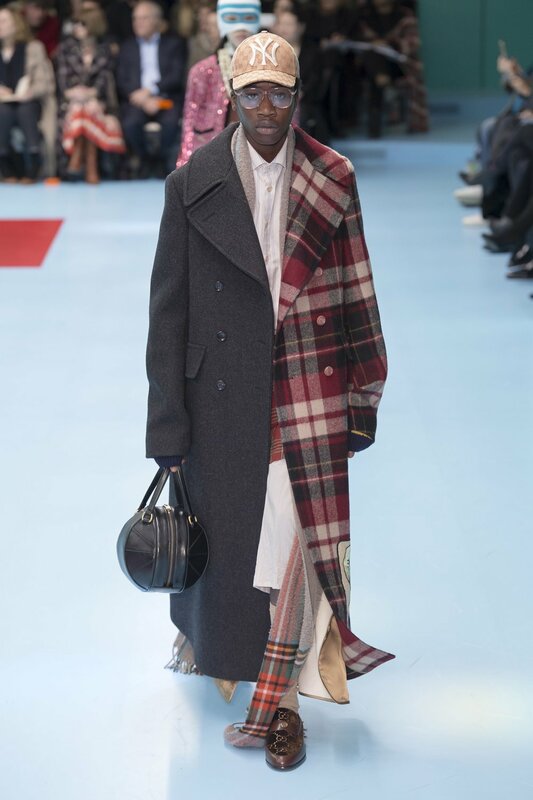 And the primary source of my confusion was the same thing that challenged me at Gucci: here is a designer using clothes to make a statement, but the statement has again taken precedence over the clothes. 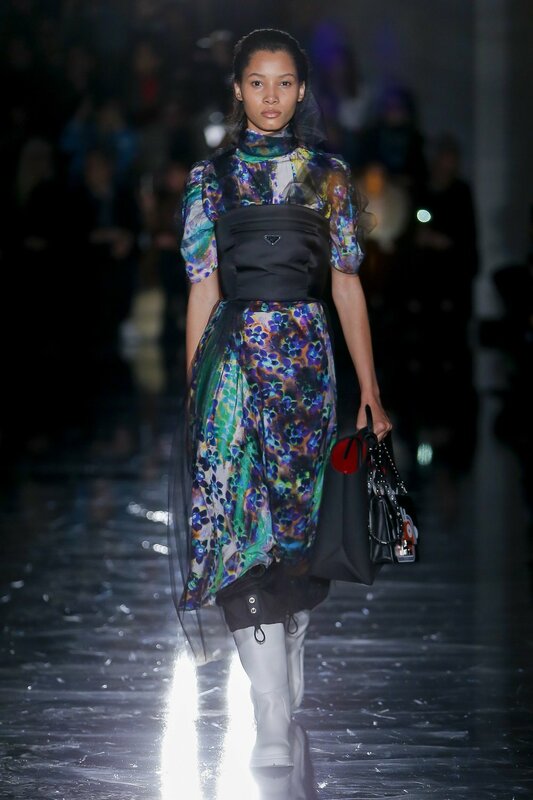 One of the elements of the show I most struggled with was the Prada branding emblazoned everywhere. I get it, I think. Between the corporate badges and the logos—we live in a capitalist age; in a world in which it seems everything is designed for sale, for consumption, for profit. And yet, even if the designers who make our clothes see this, even if they feel these shifts rapidly warping their job and their world, I'd like to see them put forth a statement on how fashion could be different rather than a statement about how it is now. These clothes felt stuck to me in the paradigm that we all now find ourselves in: fashion is consumerist and capitalistic and laden with logos and branding. It is increasingly being designed for the alternate reality that is Instagram; for the non-real than the real. Where does this leave us as women who have a real relationship with clothes? As women with real needs for the clothing in our life to serve us? To make us feel powerful, beautiful, and whole? Frankly, I think it leaves us out to dry; in want of clothes that can help us heal our relationship with fashion. 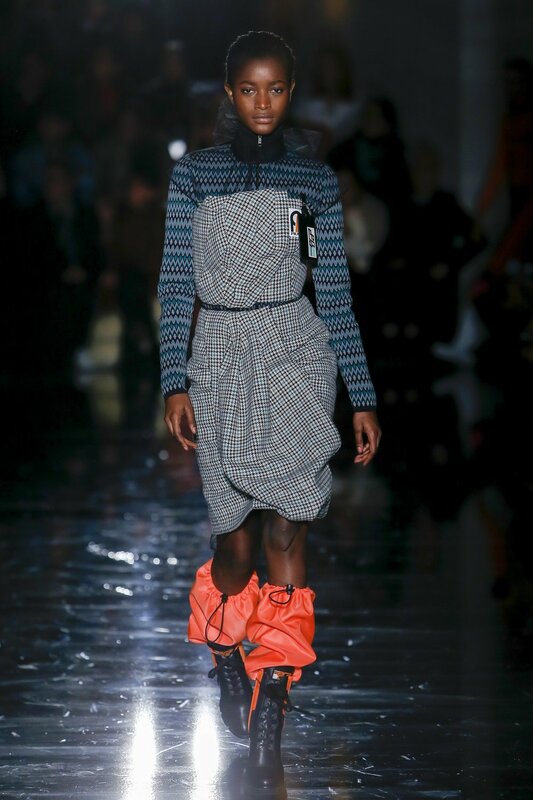 Whether or not one liked these collections, whether or not one finds this fashion meaningful, I credit both designers for putting out presentations that force us to think. Fashion is in need of that right now. A bit of hunkering down and some soul searching would do this industry good. The task at hand: construct a fashion industry that supports the design and manufacturing of remarkable clothes. Clothing that doesn't need a logo or a detached head to say something. Clothing that knows how perfectly equipped fashion is to say something on its own. 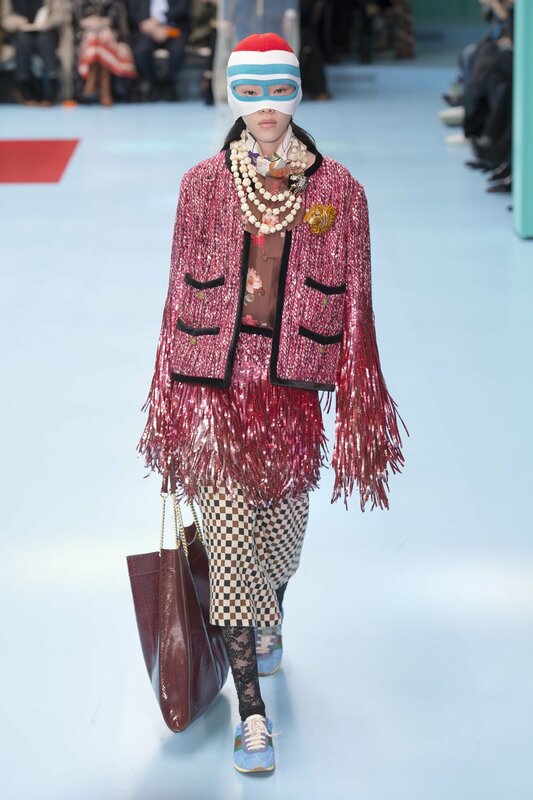 Images: Gucci by Yannis Vlamos/Indigital.tv via Vogue and Prada by Monica Feudi/Indigital.tv via Vogue.